• Describes working with all types of offsets for milling and turning applications, interpretation of part programs, applying trial cuts, making program changes, and much more. 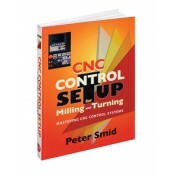 • Places emphasis on troubleshooting many common problems that occur in CNC operations. • Presents suggested methods of correction, along with methods of prevention.